Tocal College offers nationally accredited beekeeping courses developed and delivered by technical experts in the field of apiculture. This two- day course gives you the knowledge to identify and manage pests and diseases to improve the health and profitability of your colonies. This one-day course suits beekeeping and horticulture industry professionals that provide bees for pollination, require bees to pollinate their crop, or broker and audit bee hives. Interested in native stingless bees? This comprehensive one-day course covers the biology of bees from nesting to foraging and the importance of bees in natural systems. This two day practical course is suited to the more experienced beekeeper wishing to learn advanced skills in re-queening colonies and manipulating honey bee brood for particular purposes such as increasing hive numbers, managing swarm behaviour, increasing honey production, preparing strong healthy hives for pollination services and queen bee rearing. 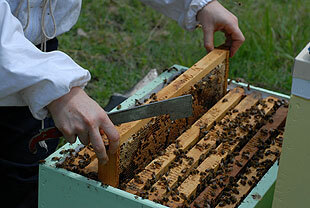 Pests and diseases of honeybees ONLINE! This online course gives you the knowledge to identify and manage pests and diseases to improve the health and profitability of your colonies. Quality books for beekeepers are available in print and digital format. Australian native bees - Combining the substantial expertise of many of Australia's leading native bee researchers, this book is a guide to observing and keeping Australia's broad range of native bee species. 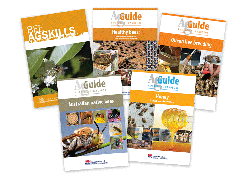 Bee Agskills - With step-by-step photographs and clear diagrams, this book is a go-to resource for all beekeepers. Includes how to use a bee smoker and work safely with bees, how to maintain hives, how to catch a swarm, how to remove and extract honey, how to replace a queen bee, and common health and pest problems. Healthy bees - This book is a guide to identifying and treating the common pests and diseases of honey bees. It covers seasonal factors that affect the health of the colony, nutrition, non-infectious disorders, diseases, exotic pests, and strategies to prevent them. Honey - This book informs beekeepers of best practices so that their hard work results in a product of optimum quality. It also informs beekeepers of the threats to honey quality which can occur through poor handling skills or poor design of facilities. Queen bee breeding - The definitive publication on queen bee breeding in Australia. Covers cell raising, grafting, nutrition, pests and diseases, reproductive biology, genetics, mating apiaries, queen banking, controlled mating, packaging and much more. Pollination using honey bees - Beekeepers and growers of horticultural crops, broadacre crops and pastures all benefit from bees visiting flowers. this book informs the beekeeper about preparing and maintaining bees so that they are fit for the pollination task and informs the grower about creating an environment for best results. Tocal eBooks are sold in the iBooks Store (Apple) and the GooglePlay store (Android). If you have an Apple iPad, get the multi-touch books from iBooks. They feature swipe-through photo galleries, videos and animations. A convenient alternative to print books.